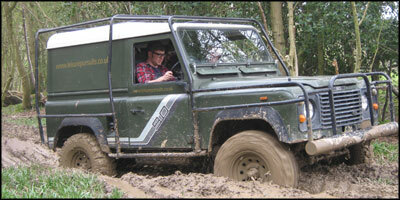 Take part in an Off Road Challenge day or learn the skills needed to take a vehicle off road. Which ever your preference you are sure to have a day full of never done before experiences. This session lasts around two and a half hours, and you will be placed in a group with up to three other participants. After a short, informative briefing session, you will have the opportunity to drive our jacked-up Kia Jeep around our steep-sided valleys. Then you will move on to a drive in our Jungle Run in a fully caged and modified Land Rover 90 Defender. 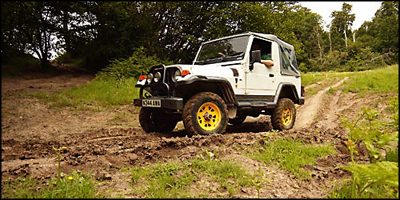 Finally, it will be time to take one of our purpose-built fully caged 4x4 trials buggies over a course too challenging for a standard-bodied 4x4 vehicle. 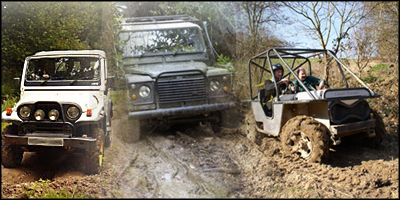 Vehicles: Jeep, Landrover 90,4x4 Trials Buggy. This is a full day (from 9:30 am to about 3:30 pm) of off-road adventure and fun, where you will be placed in a group of four to six participants. Six activities are attempted, three before and three after the two-course luncheon which we provide at the local pub: the Jungle Run or Meadow Meander; an off-road trials courses in a purpose-built buggy; two quad bike activities, the first on a Yamaha 125cc Grizzly over an obstacle course and the second a 450cc 4x4 Kodiak over challenging off road terrain, a speedy course in a 450cc rally kart and then a chance to drive a particularly unusual off-road vehicle, such as a twin-engined Power Turn that does wheelies. At the end of the event, a trophy is presented for the best overall score. Six or more friends may book as a group on any day of the week or date, subject to availability. 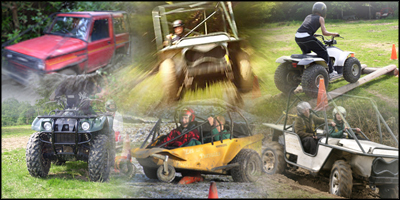 Vehicles: Jeep or Landrover 90, 4x4 trials buggy, 125cc Grizzly quad, 450cc Kodiak quad, Power Turn, 400cc Rally Karts. This is a half day (from 9:30 am to about 1:00 pm) of off-road adventure and fun. You are placed in a group of four to six participants. After being met by your instructor and booking in you listen to a safety briefing including off road driving technique. Then it’s out to experience quad biking, power turns and the Jungle Run and finally finishing with the debrief and prize giving at the local pub over a two-course lunch, included in the price. Vehicles: 125cc Grizzly quad, Landrover Defender 90, Power Turn Buggy.